Many arborists learn tree work practices without fully understanding the biological and physiological principles behind them. However, outcomes for the health and longevity of trees are greatly improved when an arborist understands the science behind the care of tree root systems and crowns. In Applied Tree Biology, Drs. Hirons and Thomas draw upon their decades of experience in the laboratory, classroom, and the field � as well as the expertise of distinguished contributors to this volume � to provide those responsible for tree care with the scientific information that informs best practices for planting, pruning, soil decompaction, irrigation, and much more. 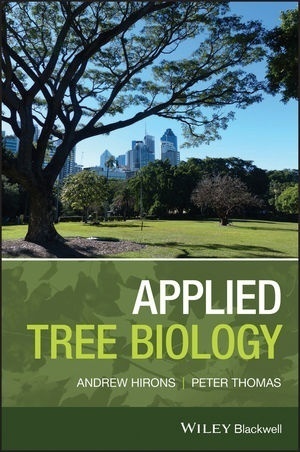 Applied Tree Biology is an indispensable source of practical, succinct information on tree biology, physiology, and ecology for professionals and interested amateurs involved with the care of trees. Arborists, foresters, and horticulturists at all stages of their careers will find this text particularly useful. Andrew D. Hirons is a Senior Lecturer in Arboriculture at Myerscough College, UK. He has international experience as a climbing arborist and a plant health care practitioner. As well as lecturing on a range of arboricultural courses he is also actively involved in research. His current research activity is motivated by the need to create resilience in our urban forests, and is focused on using plant traits to inform species selection for urban environments. Peter A. Thomas is a Reader in Plant Ecology at Keele University, UK. He has more than 30 years of experience in ecological aspects of trees and forests in the UK, Europe, North & Central America, Africa, Russia, Asia and Australasia. He is the author of several books including Trees: their natural history, now in it's second edition and widely used as an introductory text for students, and co-author of Ecology of Woodlands and Forests. Authors: - Hirons, A., Thomas, P.A.